This is the first post about my World of Wonders campaign setting. It's a speculative fiction setting with superheroes, a significantly alternate history, and science fiction elements. 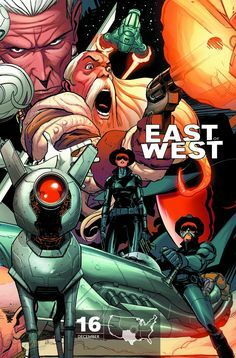 I conceived this setting well before East of West was a thing, but that's the closest parallel I can think of off-hand, so if it helps, think East of West but more superheroic. Grant Morrison's 18 Days could also be a good reference point for this setting. I originally wrote this "primer" many years ago as a single document, but for the purpose of the blog I'm going to break it into parts. Admittedly I think this section alone is a little abstract, but hopefully once I post pt. 2 it will be more clear what this world is about. Sadly this setting has been neglected in recent years, but at one point I considered this my "main" setting, long pre-dating Phantasmos. It's been several years since I've run this setting, and I imagine it could use some tuning up, maybe integrating my 100 Weird & Wonderful Superpowers. Anyway, I'm sitting on two ideas for short campaigns in this setting, one a Watchmen-esque followup to my first campaign, the other more of a Teen Titans / X-Men style teen game. The original campaign was run in Mutants & Masterminds 3e, which is a system that I appreciate for what it is but don't have too much interest playing again. Instead, I'd be really interested in trying the Valiant Universe RPG (Cue System), Masks (PbtA), or maybe giving FASERIP another go. If this setting seems interesting and you'd like to try it out, let me know. Also, I should say that I tried to write the primer in a sort of tongue-in-cheek style that sort of riffs on both Silver Age comics and some of the cliches of tabletop RPG books. Please let me know what you think of that stylistic choice as well. In retrospect I think it's still a little dry and I probably needed to lean into the stylistic writing much more heavily, but I've also been told in the past that when I do stylistic I go too far with it, so I'm never sure. In addition to my list of superpowers linked above, if you'd like to read more about my take on superheroes, check out my FASERIP Superhero Crossover One-Shot, basically a What If? My Hero Academia was the near-future of a Marvel/DC crossover (with a few other settings tossed in for good measure). Welcome to The World of Wonders! This exciting campaign setting explores a world where superheroics and magical alchemy is as commonplace as technology. Despite the myriad and complex differences in terms of historical events, cultural and religious representations, and even science, this world maintains a certain degree of parity with our own world. For instance, the impact of magic on society and its rate of development is not fundamentally different from that of technology on our own world, and many historical events still happen and historical persons still exist, albeit in some cases under very different circumstances. You are encouraged to look through the documentation (or ask your GM, if they have done their homework) to learn more about the world, but if there is no specific reference (and your GM can’t think up an answer on the spot! ), it is best to assume that the event or person did occur in this world, under whatever circumstances would be necessary for the event to make sense. Much like our own world, The World of Wonders is as deep as you want to make it; you don't need to have a Ph.D in history, theology, or the sciences to fully appreciate the world, but the more you know, the more you can do. Knowledge is power, indeed! In part due to the existence of alchemy, and in part as a result of the alternate history of The World of Wonders, certain aspects of religion and culture differ from the real world. For instance, in a world where alchemy, mysticism, and magic are empirically validated, there is less of a dichotomy between religion and science. Most people accept the existence of gods in some capacity, and furthermore there is little argument over whose gods are the “true gods”. Most people either believe all of the gods are real, or are all representations of a single truth, with the greatness of a given pantheon being determined by the degree to which it proliferates. In other words, wars are not fought over religion, but the value of religion may still be intertwined with war. Despite modern geopolitical and economic globalization, there has been less cultural homogenization than in our world. Instead of a handful of broadly-reaching empires at a given time, many smaller empires have occupied their territories for longer stretches of time. Within these empires, nations and cultures change, and occasionally throughout history these borders have fluctuated, but with only a few exceptions (particularly the 20th century), the geopolitical landscape of The World of Wonders has remained relatively stable over the centuries as compared to our own. Because of this, ethnocentrism is tacitly acknowledged, however racism in the sense that we think of it in the modern world is uncommon, as there is little historical precedence for one society being substantially more powerful than any other for any significant stretch of time. Jonathan Hickman and Nick Dragotta's comic book series East of West, while grittier and apocalyptic, is a good point of reference for what I envisioned with the World of Wonders. The World of Wonders campaign setting is named so for the titular Wonders. Wonders are the superheroes of this world, and are usually associated with a god or religious concept, although they do not have to be. While the most obvious wonders are those who are born with or spontaneously gain powers, many wonders do not have powers in the traditional sense; they are either extremely talented in a particular way (martial arts, technology, alchemy, etc. ), or they acquire a magical or advanced technological artifact. For this reason, it can be sometimes difficult to determine whether someone is a Wonder or not, or for that matter what a Wonder actually is. The study of Wonders is generally considered a field of alchemy. Pt. 2 (in hopefully ~2 weeks) will include a list of the major world powers and a brief account of the history of the world. Sounds interesting! I was trying to discern whether or not our FASERIP game was in this setting, but I couldn't tell for sure.